Precision Pinion Rod has been serving satisfied customers for over 50 years. In this time, we have built a reputation as a dependable supplier of quality brass pinion rods. Our goal is to continue providing this level of service to our customers. All tooling is done in-house by skilled craftsmen, committed to the production of quality pinion rod and fast product turnaround time. 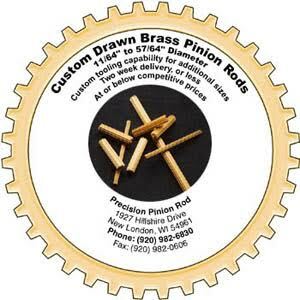 For a complete list of available brass pinion rods, see our tooling list. We can make our tooling to custom make your rod.